Why Stealth? Because these LED Stealth bar lights are installed to the posts of the sun visors and will go unnoticed until turned ON...and YOU want to be seen. 40 Generation IV 3-Watt bulbs will illuminate your vehicle with just a push of a button on the cigarette lighter power plug or on the back of the units. 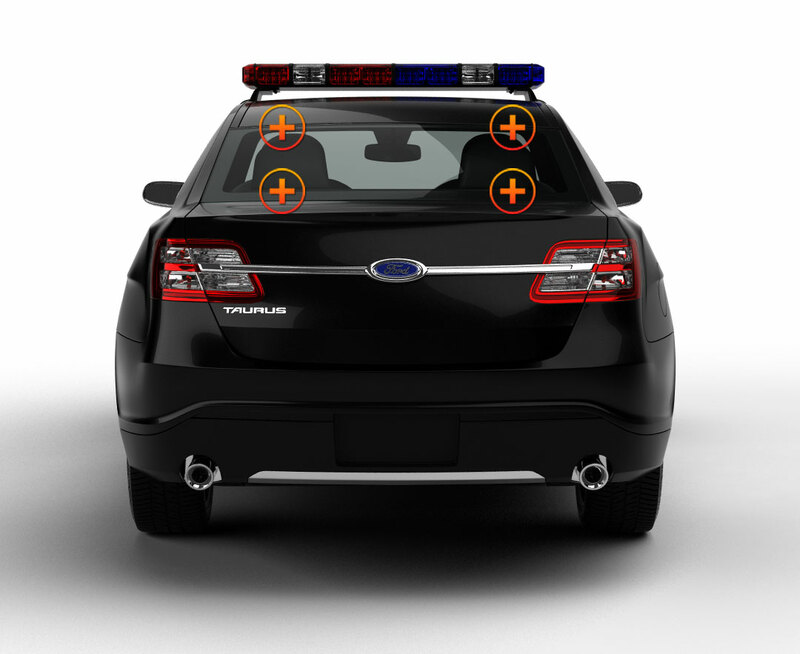 Perfect for police undercover work, these emergency visor lights blend with the windshield looking like visors even if the visors are removed. Polycarbonate, linear lenses produce a wide, intense light span for the 26 Flash patterns with pattern memory. 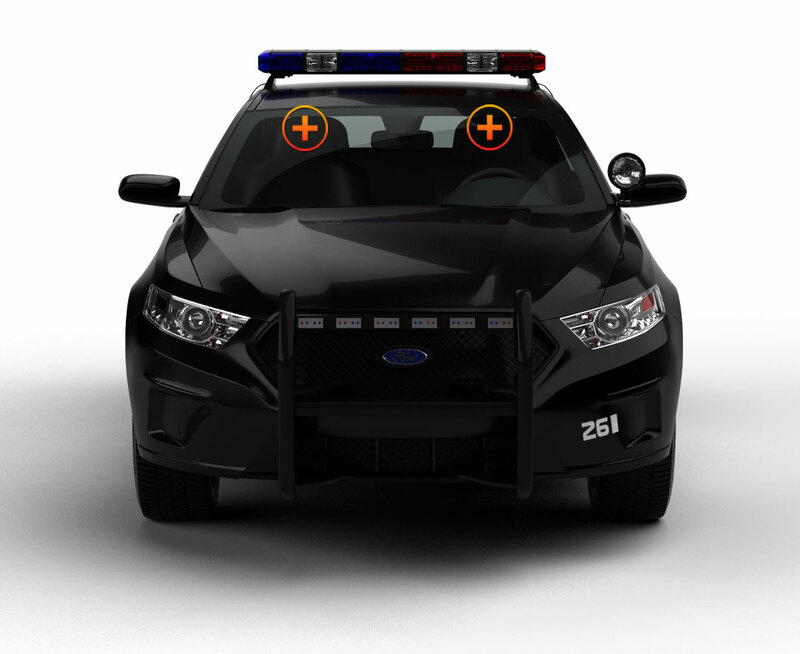 The takedown lights (which are optional at $20) are located in the innermost module of the visor lights to the right and left of the rear-view mirror. The power cord plugs into the cigarette lighter; digital controls are built into the back of the visor unit on the driver’s side. A flashback shield is attached to the visor light, for your eyes must be protected from the intensity of this light. Always remember to test your new lights by plugging them into the cigarette lighter to make sure they are functioning properly BEFORE you mount them….and DON’T look directly at these lights at close range. It may be the smaller of the Stealth bar, but it certainly doesn't seem like it! I love how bright it is, the pattern display on the back makes it easy to use. Overall, great product, I would recommend highly. This light is all around awesome. It is very bright and has easy viewable access to the pattern and controls. I had a little trouble installing it but it was due to the design of my cars visors being smaller i do believe. I wish they would add a pattern option that would cycle through all the patterns. So far I have went through them all and if it has that option I'm missing it. This is also the only one of these lights that I have installed that has little to no glare if installed properly. Overall this light is well worth the money and they get you your equipment fast! Awesome place awesome light! Thank You! Great Product! Super bright, really happy i didn't dump money into the 6 or commander this one simply rocks. I ordered it and got it next day. I didn't put it into the normal type of car so I had some issues with the brackets fitting but they seem to be working great. Highly recommend this product! hey guys! well i ordered these lights on 8/1/2012 and got them in on the 3rd! amazing shipping time, the product was great quality! loved the lights,iv ordered alot of products from ETD and after i install these this weekend i will like to post a vid of all the lights on my pov.i highly recommend these lights to anyone and everyone,great product and service!